I have been asked, and I continually ask myself if I am ready to wean. I have been in this place before where the possibility of weaning is on the table, and I have to decide what to do. Each time, (at 14 months, 18 months, and 22 months) I felt pressure from various doctors to wean my son… and I was definitely NOT ready to wean. 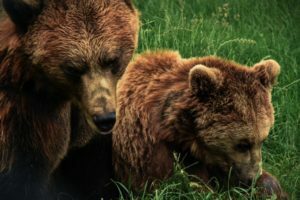 I felt emotional about the mere suggestion; I felt protective over my relationship and bond with my child; and I felt Mama Bear anger toward anyone who would even think of taking this precious and nutritious experience away from him… and from us! Needless to say, I did not wean at those times. My little guy is over two years now (the recommended age to breastfeed until by the World Health Organization), and we are getting closer to understanding a health consideration which led to some of these suggestions to wean earlier than was comfortable for me. To make a long story as short as I can, my little growing baby was growth restricted inutero. This means he did not have enough nutrition inside me to grow to his full potential, and he was born small for gestational age (SGA). The tendency is for growth restricted SGA babies to grow quickly outside the womb and to become obese. Between 12-18 months, my son gained weight too rapidly for his pediatrician’s comfort. We were referred to UCSF Endocrinology to find out more. The possibilities here, from a western medical perspective, are that there could be metabolic or genetic issues leading to excess weight. We have been working with his nutrition and activity level (he is a healthy eater and a very active kid, so these are not really problems) while still seeking other opinions. Our new pediatrician does not see an issue other than her recommendation to eat sauerkraut twice a day and drink and/or use bone broth for cooking regularly. These two suggestions actually made a difference, and finally his weight stabilized. Still, there was one more doctor who wanted to see him, our family Ayurvedic doctor. This was a very different situation, not only a different perspective but also she wanted to see him, rather than us seeking her out for him. She was very clear and thorough in her assessment, even bringing in other Ayurvedic doctors to offer their insights. They all agreed. My boy is fine. No need for anymore western medical testing. However, more dietary changes are in order (to reduce mucus in the body), and we need to stop breastfeeding. I was included in this assessment. She took one look at me and saw how deeply tired I am. I felt incredibly seen by her. I expected to feel confronted, confrontational, and argumentative. Instead, I felt grateful for her thoroughness and honesty. She even tested my breastmilk to see how compatible it was with my son and his digestion. It turns out that my milk is too heavy for him, so some of the dietary considerations are for me… even just for the remainder of time nursing. So, am I ready to wean? I am. I feel surrendered. I also feel a little trepidation and want to see how it goes for all of us. My partner’s part is that he has to take a larger roll in some of the hard stuff with our son, like the middle of the night wake ups. In Dr. Sears’ book “The Baby Book”, I think his wife wrote the section on weaning. She writes two things that particularly interest me. 1) Wean from breast to person, rather than from breast to thing. This means dad or someone else steps in to help. 2) The baby weans from the mother. The mother does not actually wean from the baby. The second is so beautiful because it reminds me to really pay attention to what he is ready for. Whether or not I am ready or not ready to be independent from breastfeeding, it is really an activity that is for him. It supports his development. I benefit from the bond that is deepened and supported by breastfeeding, but the essence of nursing is to feed my child. He is fed. He is well fed! I am happy for that. I am ready and excited to move on… in a pace that elicits a strengthening of our bond and enjoyment of each other… not to mention a continued thrive for life! What feels even more important than being ready is that I am intensely interested in what is happening. It is a moment by moment process for me. Today it feels good and natural to be weaning. I love encouraging him along his path of development. I love learning and growing as we go. I love getting various perspectives and feeling into what rings true in my heart. I often do not know what that is till it happens. Our Ayurvedic doctor is a gift to me. She sees me, and she sees my son for who he is. I needed that. I needed us, mother and child, to be considered on a personal level rather than on statistics. We even have the added bonus of my partner being an essential part of this consideration too. I am ready to gently wean my son and see how he takes to it. I am ready to be supported in this weaning process by my partner. I am ready for the gifts that may come to us, as a family, as we move into this new phase of life together! Storm can now go 17 hours without nursing and without stress. He does cluster feed on either end of that. He is in great spirits and enjoyed playing with his friends at preschool today. He and another young boy were actually making each other laugh while animating and sharing a toy calico cat. Let me say, there is nothing like the sound of two little boys laughing together at the sheer joy of their own creativity and playful connection!! !